RUSHING - St. Joseph, Tyler Matakevich 31-111, Joe Della Vecchia 6-34, Tony Civitella 2-4, Joe Burns 1-1; Montville, Tyler Girard-Floyd 10-29, Skyler McNair 7-48, J.P. Morales 6-53, Jesse Sutherland 3-17, Dave MacCracken 1-1. PASSING - St. Joseph, Della Vecchia 4-9-1-18; Montville, Morales 3-7-1-76. RECEIVING - St. Joseph, Matakevich 2-7, Pat Mulligan 1-8, Burns 1-3; Montville, Sutherland 3-76. RUSHING - East Lyme, Kevin Miao 15-49 yards, Jordan McCoy 10-47, Jacob Grills 6-8; New Canaan, Peter Park 12-63, Turner Baty 11-57, Tim Robustelli 10-32, Darryl Cummings 5-21, Conor Goodwin 3-(-2). PASSING - East Lyme, Jacob Grills 4-12-2-31; New Canaan, Turner Baty 19-32-1-224. RECEIVING - East Lyme, Will Calkins 2-19; Eric McGlone 1-6, Brendan McDermott 1-6; New Canaan, Cody Newton 10-125; Willie Ouelette 4-48; Peter Park 3-30; Kevin Macari 1-17, Conor Goodwin 1-4. RUSHING: Notre Dame: Justin Willis 18-72; David Rose, 15-52; Pomperaug: Ben Crick 11-114; Andrew Clements 13-80. PASSING: Notre Dame: Sean Goldrich 6-13-0-121; Pomperaug: Andrew Clements 10-22-3-105. RUSHING - Bethel: Pete Gallagher 15-42, Bill Ramirez 3-(-9), Brandon Schmidt 7-19, Randy Lowenadler 2-7. Berlin: Max DeLorenzo 44-332, Taylor Tavarozzi 3-10, Dave Campagna 5-23, Dan Hackett 2-4. PASSING - Bethel: Ramirez 5-13-0, 144 yds. Berlin: Hackett 8-13-0, 152 yds. RECEIVING - Bethel: Brian Sheridan 1-8, Lowenadler 1-29, Brandon Schmidt 1-9, Javier Reyes 1-71, Gallagher 1-27. Berlin: Tom Undercuffler 2-51, Brian Malloy 1-28, Max DeLorenzo 3-46, Mason Powers 1-5, Dave Campagna 1-22. RUSHING-Cheshire, Greg Palmer 22-72, Dan Sweeney 11-28, Brian Havlicek 1-2, Sebastian Little 1-0; Staples, Matt Kelly 19-43, Keith Gelman 13-7, Ryan Burke 4-5. PASSING-Cheshire, Greg Palmer 9-14-88-1; Staples, Keith Gelman 16-19-245-1. RECEIVING-Sebastian Little 3-39, Brian DeBisschop 2-30, Dan Sweeney 2-12, Ryan Connolly 1-5, Max Slade 1-2; Staples, Brendan Rankowitz 8-119, Matt Kelly 3-76, Pat Murray 5-50. 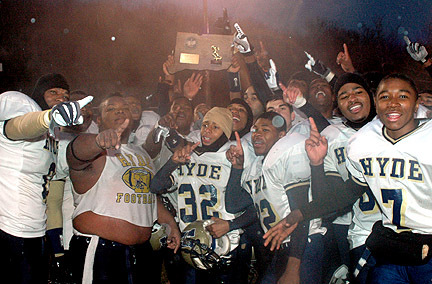 WATERBURY, Dec. 1 – With a swarming defense that caused five turnovers, Hyde won its fourth state championship this decade with a dominating 21-0 win over Northwest Catholic in the Class S championship at Municipal Stadium in Waterbury before an estimated 1,500 fans sitting in a mix of snow, sleet and rain. The Howling Wolves (11-1) recovered four NWC fumbles and intercepted QB Jack Murphy once. Hyde’s DeShawn Murphy had three sacks, including two sacks on back-to-back plays late in the first half when Northwest (10-2) had its best scoring opportunity of the game. Trailing 14-0, the Indians drove to the Hyde 14-yard line with 1:15 left in the second quarter. But Northwest QB Jack Murphy was sacked twice for losses for 11 yards and five yards by DeShawn Murphy. Hyde senior Joe Lambert caught a 44-yard TD pass from senior quarterback Kendell Groom, and tossed a 60-yard touchdown pass to senior DeShawn Murphy on a half-back option, to help Hyde grab a 14-0 lead in the second quarter. The Howling Wolves forced four turnovers (fumbles) in the first half. Three-hundred pound senior Justen Wilson added a 1-yard touchdown run in the fourth quarter for Hyde, leaping over a pile of defenders into the end zone. Wilson rushed for a team-high 66 yards on 13 carries. Lambert added 13 carries for 46 yards. 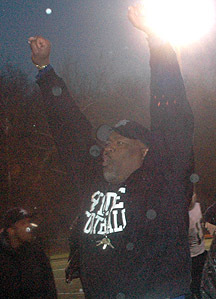 The second-seeded Howling Wolves (11-1) also won in state titles in 2000, 2004 and 2005. Junior Ras Morgan led the top-seeded Indians with 59 yards on an interception. 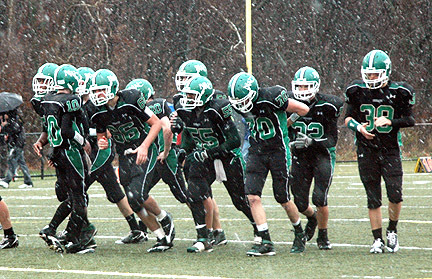 Northwest Catholic (10-2) was playing in its first state title game. 12 carries. Senior quarterback Jack Murphy completed 5 of 18 passes for 34 yards and an interception. NW Catholic was playing in its first state title game. WATERBURY, Dec. 6 – It turns out that few teams could stop Berlin’s Max DeLorenzo. Just five days after setting new school records for rushing yards (284) and attempts (39) in a seven-point victory over Avon in the semifinals, DeLorenzo ran for a school-record 332 yards on 44 carries and scored 4 TDs to lead Berlin to its first-ever state championship with a dominant 49-6 win over Bethel in the Class M championship game. Only New Britain and Simsbury held the hard-running back under 100 yards this season. DeLorenzo had just 75 yards against Fermi but he made only two carries. Against Bethel, Berlin (10-2) dominated from the start, taking the opening kickoff 60 yards in 14 plays despite three minor penalties. DeLorenzo capped the drive with a two-yard run. DeLorenzo scored his third touchdown of the first half on a 35-yard pass from Dan Hackett to give Berlin a 25-0 halftime lead. Bethel (9-3) scored its lone touchdown in the third quarter when quarterback Bill Ramirez hit Javier Reyes for a 71-yard catch and run. WEST HAVEN, Dec. 6 -- Michael Skibicki scored on a 2-yard run in the first overtime and Brian Havlicek forced a fumble which Luke Scinto recovered to give Cheshire High School its 28-21 win over previously unbeaten Staples of Westport in Sunday's CIAC Class LL championship game at Ken Strong Stadium. It's the seventh state title for the third-seeded Rams (11-1). It was also the fourth overtime in 180 state finals played. The last OT games came in 1990. Staples (12-1), the top-ranked team in all three state polls, trailed 21-7 with 4:45 left in regulation when it scored twice to force overtime. Cheshire had the ball first in overtime, and Skibicki's touchdown was his only carry of the day. Greg Palmer ran 22 times for 72 yards and two touchdowns for Cheshire. He was also 9 of 14 for 88 yards, including an 8-yard touchdown to Havlicek, and threw an interception. Keith Gelman was 16 of 19 for 245 yards with a touchdown and an interception for the Wreckers and scored on a 1-yard run with 1:44 remaining in regulation to cut his team's deficit to 21-20. Brendan Rankowitz had eight catches for 119 yards and a touchdown for Staples and Matt Kelly ran for 43 yards and a touchdown on 19 carries. WEST HAVEN, Dec. 1 - Tyler Matakevich scored a pair of one-yard touchdown runs in the fourth quarter and No. 4 St. Joseph of Trumbull defeated Montville, 14-3, in the Class SS state title game at Ken Strong Stadium. The Cadets (10-2) took advantage of six Montville turnovers, including five lost fumbles, to win the school's ninth state title and first since 1990. Matakevich ran for 111 yards on 31 carries, but only had two carries over 10 yards. Montville quarterback J.P. Morales connected with Jesse Sutherland on a 52-yard pass play on Montville's first play from scrimmage, but the Indians had the first of their six turnovers on the goal line when Morales couldn't handle a snap three plays later. Morales threw for 76 yards, all to Sutherland, and ran for 53 more. Montville's Ben Middel kicked a 47-yard field goal as time expired in the first half to give Montville (10-2) a 3-0 halftime lead. SHELTON, Dec. 1 - Conor Keniry snared an interception with 10.7 seconds in his own territory to help the third-seeded Notre Dame football team outlast top-seeded Pomperaug 28-21 and win the Class L state championship Saturday afternoon at Finn Stadium. Notre Dame (11-1) made three interceptions and two fumble recoveries to finish with 10 straight victories. Keniry also had a fumble recovery early in the third quarter while Tirrell Young-Williams returned another interception 93 yards for a touchdown for the Green Knights in the second quarter. Notre Dame quarterback Sean Goldrich completed 6 of 13 passes for 121 yards and a 70-yard touchdown to Young-Williams. Justin Willis led the rushing attack with 18 carries for 72 yards while David Rose finished with 52 yards and two touchdowns on 15 carries for the Green Knights, who won their first state championship since 2001. Pomperaug quarterback Andrew Clements completed 10-of-22 passes for 105 yards, one touchdown and three interceptions. He also ran for 80 yards on 13 carries. Benjamin Crick led the Panthers (12-1) with 114 yards and a touchdown on 11 carries. STRATFORD, Dec. 1 -- Turner Baty completed 19 of 32 passes for 224 yards with four touchdowns and an interception to lead top-seeded New Canaan to its 28-0 win over East Lyme and win its fourth straight CIAC Class MM championship at Bunnell High School. Cody Newton had 10 catches for 125 yards and three touchdowns for the Rams (11-1). Willie Ouelette added four catches for 48 yards and a touchdown. Kevin Miao ran 15 times for 49 yards for the No. 2 Vikings (10-2) and Jordan McCoy added 10 carries for 47 yards. 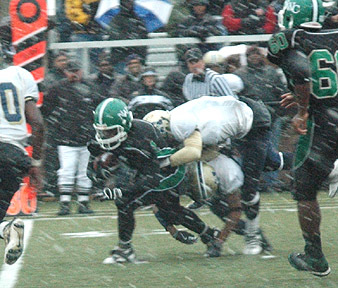 n Hyde defenders tackle Northwest Catholic's Jack Hayes in Saturday's Class S championship game in Waterbury.